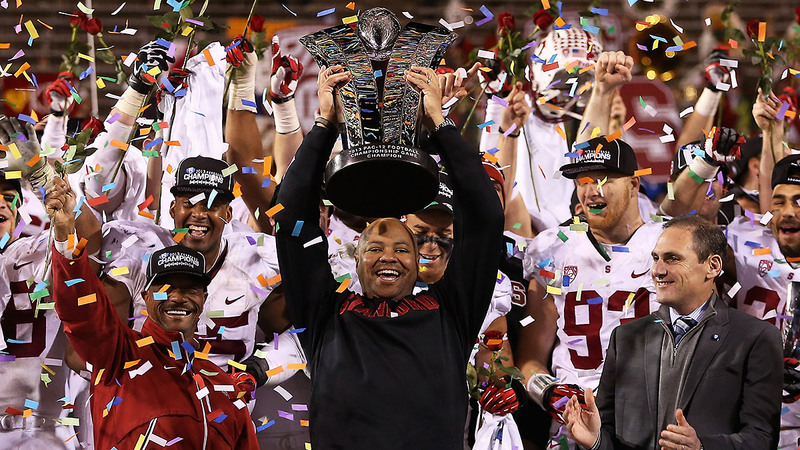 » Cardinal at a Crossroads: Is Stanford’s Golden Era Coming to a Close? Cardinal at a Crossroads: Is Stanford’s Golden Era Coming to a Close? There comes a point in every disappointing season when scales fall from eyes, wind abandons sails, and even the true believers have to come to grips with reality: This team is not the team it was supposed to be, and it’s not going to get there. For Stanford, the point of no return came last weekend in a mind-numbing, 20-17 loss to Utah, the Cardinal’s fifth defeat on the year, and one made all the more depressing by the thought of the few remaining invested fans having to suffer through two overtimes before getting smacked with the inevitable. The teams combined for 10 consecutive punts after halftime, though given the state of the Stanford offense, that may have been the best possible outcome. That game pretty much summed up Stanford’s season: habitual hope, punctuated by bouts of futility, ending in frustration. The Cardinal are 5-5, and, with road games remaining against Cal and UCLA, face the very real possibility of settling for their first losing season since 2008. Three of their five losses (to USC, Notre Dame, and Utah) have come by a combined nine points, but in those contests the offense managed just four total touchdowns in regulation. Only one of Stanford’s five wins has come at the expense of a team that currently boasts a winning record (6-5 Washington, which is barely treading water itself after dropping four of its last five). A 45-16 flop against Oregon on November 1 marked Stanford’s most lopsided setback since 2007; the Utah loss, which played out in a half-empty Stanford Stadium, marked the Cardinal’s first back-to-back defeats since 2009. Of course, the dejection is also a reminder of how much higher the bar for success is at Stanford today than it was just a few years ago. When Shaw returned to his alma mater in 2007 as part of Jim Harbaugh’s incoming coaching staff, the prospect of a .500 season was distant at best. At that point, the Cardinal were coming off a 1-11 debacle in 2006, their fifth consecutive losing campaign under two different head coaches; that same year, Stanford Stadium had just become the only campus venue in recent memory to undergo a major contraction, which lowered capacity from 85,500 to 50,000. But the program that Harbaugh and Shaw raised from the ashes seemed built to endure beyond a single star or recruiting cycle. From 2010 to 2012, Stanford lost a Heisman runner-up (Toby Gerhart), a head coach (Harbaugh), and another Heisman runner-up (Andrew Luck) in successive seasons, plus 11 NFL draft picks in all, yet managed to go 35-5 in those seasons with three consecutive top-10 finishes in the AP poll.1 Last year, the Cardinal further cemented their status as Pac-12 overlords by manhandling their perennial foil in the North, Oregon, and dispatching five other ranked teams en route to their second consecutive Rose Bowl berth. This year, Stanford opened at no. 11 in the preseason AP poll — and even higher at some other outlets — despite a mass exodus of talent from 2013, with eight players graduating or leaving early for the draft after being named first- or second-team All-Pac-12 by league coaches. Attrition aside, we all knew what to expect: The team that had earned four consecutive BCS berths would again contend. In February, Shaw had signed another top-25 recruiting class, his third in four years, according to the major recruiting sites, further deepening the impression that the Cardinal had graduated from rebuilding to reloading. Stanford had become the exemplar of a winner built “the right way,” proof that rigid academic standards don’t have to be intractable barriers to championships. At a longstanding football factory in the South or Midwest, such a steep departure from expectations would be met with a rending of garments among fans, if not a sharpening of pitchforks. At Stanford, the dynamic is different: The fan base doesn’t live and die with the fate of the football team or threaten to turn into a talk-radio tinderbox when the record begins to flatline. It ceases to exist. The “Revenge of the Nerds” narrative has tended to unfold along two parallel strands, one devoted to Stanford’s academic rep, and the other to its emergence as an unlikely bully in the trenches. For most struggling programs, making up ground over the last decade has meant spreading the field, emphasizing speed at the skill positions in an effort to minimize disadvantages along the line of scrimmage. Stanford is the only long-term project that has succeeded largely by creating those disadvantages instead: Under both Harbaugh and Shaw, the Cardinal have embraced a methodical, between-the-tackles mentality that stood in stark contrast to the frenzied pace by which Oregon had conquered the coastline under Chip Kelly. 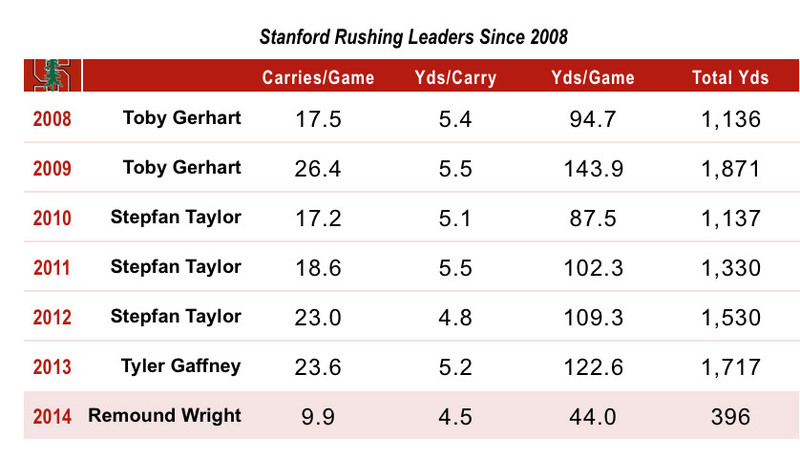 From 2008 to 2013, the Cardinal produced four All-Americans3 and nine all-conference picks on the offensive line, and were anchored by a succession of sturdy workhorses in the backfield (Gerhart, Stepfan Taylor, Tyler Gaffney) who collectively averaged 1,454 yards per season and 110 yards per game in their turns as the feature back. 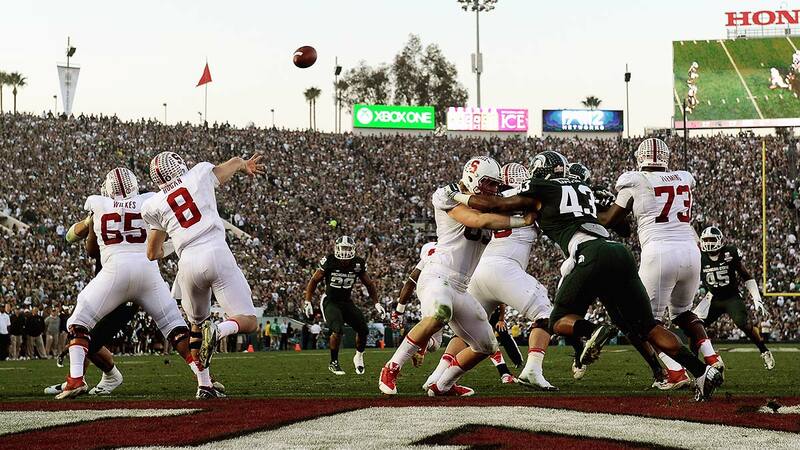 Even with a can’t-miss, once-in-a-generation talent like Luck under center, the vast majority of Stanford’s playbook revolved around the Cardinal’s ability to grind opposing defenses to dust up front. That philosophy extended to the passing game, which thrived on play-action, and specifically on exploiting personnel mismatches in favor of the Cardinal’s cache of huge, athletic, NFL-bound tight ends (Coby Fleener, Zach Ertz, Levine Toilolo), who were equally adept as blockers and receivers. Their presence allowed Stanford to pound away and attack deep with the same personnel, a nightmare scenario for defensive coordinators. To some extent, the 2014 regression can be traced to the absence of those versatile targets and an every-down back that defenses are forced to respect. To be fair, the offensive line was something of a question mark coming into the season, with four new starters moving into spots vacated by long-tenured veterans. But two of the fresh faces, Kyle Murphy and Joshua Garnett, arrived on campus in 2012 as five-star recruits, as did the lone returning starter, towering left tackle Andrus Peat, who was widely regarded as a first-round prospect in the mold of Jonathan Ogden. (And still is.) Given that pedigree, the results have been underwhelming: Including sacks, the Cardinal have yet to crack 200 yards rushing in any game this season after averaging a little more than 200 yards on the ground last year (and in 2009, 2010, and 2011), and currently rank 55th in Adjusted Line Yards, down from 12th in 2013. In the five losses, they’ve been held to an average of 114.6 yards on 3.4 per carry, especially struggling in road lapses at Notre Dame (47 yards on 1.5 per carry) and Arizona State (76 yards on 3.5 per carry). Behind the line, Stanford has been unable to settle on any back, spreading carries among the pedestrian trio of Remound Wright, Barry Sanders,4 and Kelsey Young. Wright, a 5-foot-9, 204-pound senior, is the closest approximation of his predecessors physically, and has earned the lion’s share of carries; so far, though, the results have been more plodding than productive. Sanders and Young are the proverbial change-of-pace backs, but they haven’t changed it much (neither has reached the end zone this season in any capacity), and coaches have occasionally resorted to using dynamic wide receiver Ty Montgomery in a Wildcat role in an attempt to create a spark. Collectively, the Cardinal have more lost fumbles (12) than rushing touchdowns (11), and just saw a 31-game streak with at least one rushing TD snapped in the loss to Utah. The combination of an increasingly ineffectual ground game and a stale passing attack has knocked the offense so far afield from its familiar course that it seems to lack a coherent identity. The tight end position has bounced back somewhat after vanishing entirely last year, but sophomores Austin Hooper, Eric Cotton, and Greg Taboada (42 combined receptions) are not yet reliable targets who can consistently stretch opposing safeties downfield. Montgomery, unquestionably the most electric player on the offense, has 60 receptions, just one shy of his total for all of 2013, but at the cost of nearly six yards per catch; after accounting for 14 total touchdowns last year, he has just six this year, only three of them in his capacity as a wide receiver. True freshman Christian McCaffrey has emerged as a fan favorite, averaging 10.5 yards per touch as a running back and receiver out of the backfield, but he has just 34 touches in limited packages. Hogan has struggled through a vague leg injury and may be looking to take his chances in the draft after he earns his degree in the spring, even though he has a fifth year of eligibility remaining in 2015 and is hardly considered a coveted pro prospect. If the offense can no longer rely on the cloud-of-dust philosophy that underpinned Stanford’s ascent, though, what can it rely on? So far, this season has served as a rambling, incoherent attempt at an answer that has not arrived. Unless things change dramatically in the next two weeks, Shaw’s offseason will be devoted to solving the same question. A more charitable interpretation of Stanford’s record would insist on acknowledging that all five losses have come at the hands of ranked opponents — ranked at the time, anyway — and that, as mentioned, the losses to USC, Notre Dame, and Utah were decided by just three points apiece; all told, the Cardinal are only the proverbial handful of plays away from an 8-2 record and maybe enjoying some low-level buzz about repping the Pac-12 in a major (non-playoff) bowl game. Certainly, if that were the case, no one would be speculating that the program has lost its mojo. If that happens, or if Stanford limps into a barely recognizable, bottom-rung bowl at 6-6,6 it will be hard to fend off the suspicion that its window for national relevance is coming rapidly to a close. Historically speaking, each of the last four seasons ranked among the best ever at Stanford in its own right; collectively, no other four-year period even comes close. Maybe a couple of overachieving recruiting cycles in a watered-down conference is the best-case scenario after all, and the upward trajectory of the Pac-12 as a whole is finally catching up to the Cardinal just as they’ve arrived at a natural plateau. A regression to the historical mean was widely predicted after Luck’s exit for the next level; maybe that pessimism was just a few years too soon. On the other hand, with a strong finish, it’s still possible for Stanford to cruise into the offseason with nothing but green lights ahead, feeling like the worst is behind it. To get to that point, either the young players on offense will have to grow up into their existing roles in a hurry or coaches will have to adapt their muscle-bound M.O. for one better suited to the current lineup. Either way, it’s time to consider that after years of staff turnover and natural attrition on the depth chart, the status quo (at least on offense) has run its course. From here forward, the Cardinal will have to earn back the benefit of the doubt, beginning with their own base. Those 35 wins tied Alabama and Boise State for second nationally in that span; only Oregon (36) won more. Three other teams in the preseason top 20 — Notre Dame, Clemson, and LSU — fell from the Top 25 last weekend following bad losses, but are still lingering in “Others Receiving Votes” purgatory. With five losses apiece, neither the Gamecocks nor the Cardinal are likely to receive another vote this season. Chase Beeler (2010), David DeCastro (2011), Jonathan Martin (2011), and David Yankey (2012-13). Yes, he’s the progeny of that Barry Sanders. As of midweek, Stanford was listed as a 5.5-point favorite against Cal. Some projections suggest the Cardinal are bound for the Royal Purple Las Vegas Bowl, or perhaps the Armed Forces Bowl, in Fort Worth; others don’t see them in the postseason at all.